Raspberry puree, homemade coconut yogurt, vanilla protein yogurt, and lime marinated strawberries topped with coconut and fresh mint leaves. 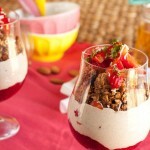 To make the strawberry topping: mix the apple juice, coconut sugar, lime zest, and lime juice in a medium sized bowl. Add the strawberries and place the bowl in the fridge for 30 minutes. To make the raspberry sauce: dilute arrowroot powder with cool water. Set aside. Heat the raspberry purée and lemon juice in a small pot on medium heat, whisking for 2-3 minutes. Add the arrowroot mixture to the raspberry mixture and continue to whisk until boiled. It should get thicker over 2-5 minutes. Once you’ve reached the desired thickness, allow to cool before dividing between two glasses. Bringing it all together: raspberry sauce should already be at the bottom of your two glasses. 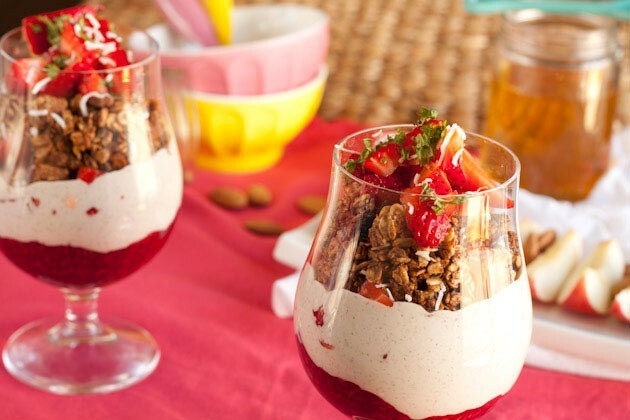 Top with yogurt, then granola, strawberries. Repeat once more and top with mint leaves and shredded coconut.